It seems like so many people that I know love pulled pork. They love it because it's a crockpot meal and it's easy! I never liked pulled pork because...I don't like BBQ sauce (I know terrible, right). But I wanted to try making a pulled pork that both me and the hubby could eat and enjoy! And I wanted it to be easy! I also needed to be able to throw it in the crockpot and not do too much fussing! So I turned to my good buddy Pinterest and found lots of pulled pork recipes that did not call for BBQ sauce! 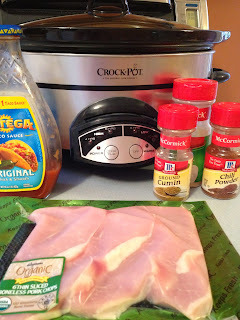 I mixed and matched a few recipes to come up with my Crock Pot Pulled Pork Tacos! And they are delicious! I made them once, then twice...and now they get made about every three weeks! It couldn't be more simple! There are really two required ingredients and well, then, you can put in whatever else you want and serve it however you like! That makes this the perfect use what you have recipe! John and I enjoyed these crockpot pulled pork tacos for our own little Taco Tuesday date last night after the girls were asleep! taco fixings - tortillas, shredded cheese, shredded lettuce, sour cream, diced tomato, etc. This was what was left after we ate! I didn't remember to take a before pic because we were starving! But you get the idea of what the meat will look like when shredded as well as how the sauce darkens and thickens! We enjoy these tacos in small flour tortillas topped with mexican cheese and shredded lettuce! If I was serving this to guests I would put out bowls of sour cream, diced avocados, and diced tomatoes to make it fancier...but when it's just John and I we are really pretty simple! If you love onions (or just have one that you want to use up) you could add diced onion to the crockpot! If you had a can of diced green chilies in your pantry, that would be a good addition too! Have fun! And enjoy eating this new spin on Taco Tuesday! Yum, I will be trying this very soon. I don't like BBQ stuff either so I think these will be perfect for our family!